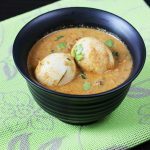 Egg kurma recipe – kurma or korma is a saucy dish originated in central Asia and is made of spices, meat, vegetables, yogurt, seeds or nut paste. 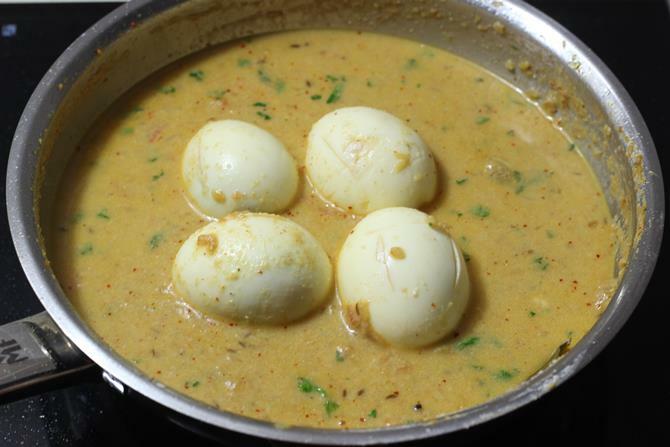 This simple egg kurma is roughly adapted from few South Indian recipes that I have already shared. It pairs very well with any biryani, rice pulao, parotta or even with chapathi. When ever I have guests for a meal, I prefer to make this to go with any kind of chicken biryani or veg biryani or even pulao since it is quick if we have boiled eggs ready. 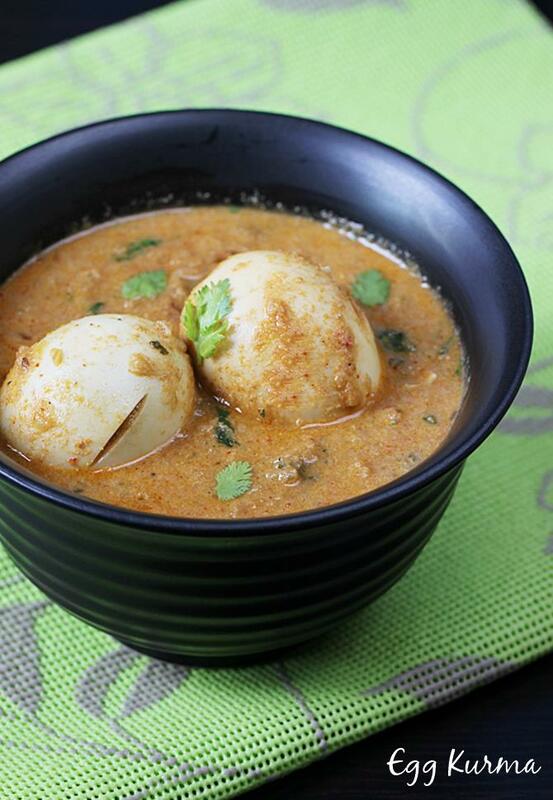 Egg kurma or korma is a simple dish made by cooking boiled eggs in a thick onion tomato & nut gravy. Saute bay leaf, cinnamon, cloves, cardamoms, jeera, mace and star anise in oil until they begin to crackle. Then add onions & fry until golden. Saute ginger garlic paste until the raw smell vanishes. To the onions add tomatoes, turmeric and salt. Fry until they turn soft. Add chilli powder, saunf & coriander powder. Fry until fragrant. Next add coconut paste and fry until fragrant again. Add in pudina and coriander leaves. Saute for a minute. Pour water just enough to make a thick gravy. Simmer and cook until the gravy thickens slightly but not too thick. Add eggs and allow them to cook in the gravy for a while. You can see traces of oil on top. 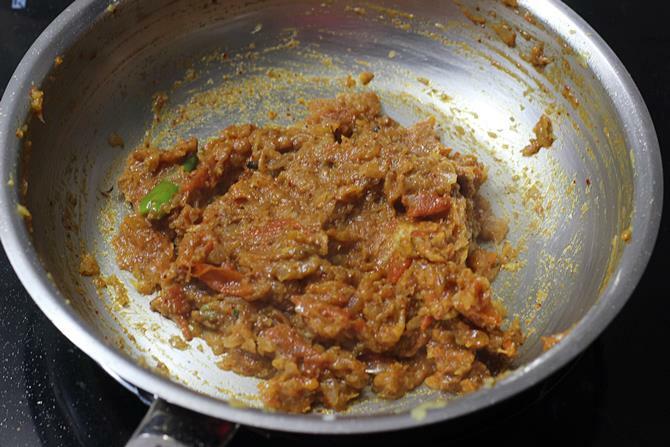 You can also fry the eggs and add it to the kurma. 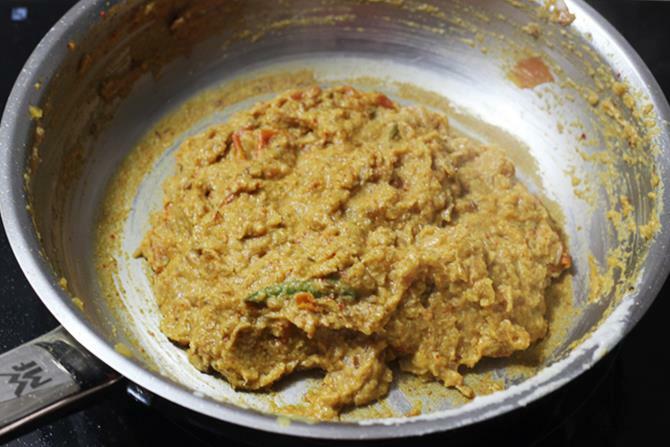 Switch off egg kurma when the gravy reaches a desired consistency. Garnish with few chopped coriander leaves. 1. Boil the eggs, remove the shells and make few incisions randomly and set aside. 2. 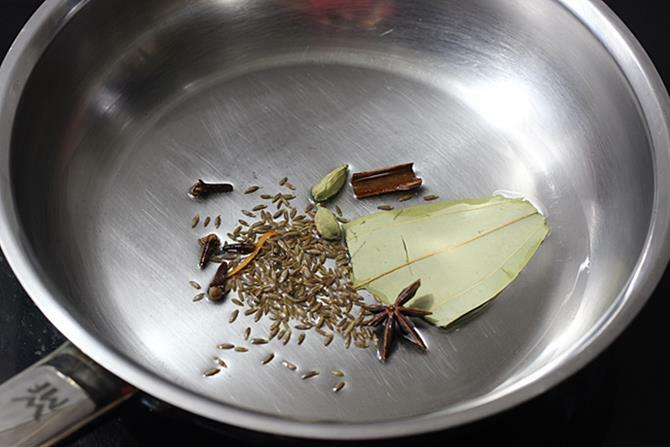 Heat oil in a pan, add cinnamon, star anise, cloves, jeera or shahi jeera and bay leaf. You can also add crushed saunf or fennel seeds. I used it along with the other spice powders later. Do not use too many spices if you are making this to go with a biryani, stick on to the quantity mentioned in the recipe. 3. 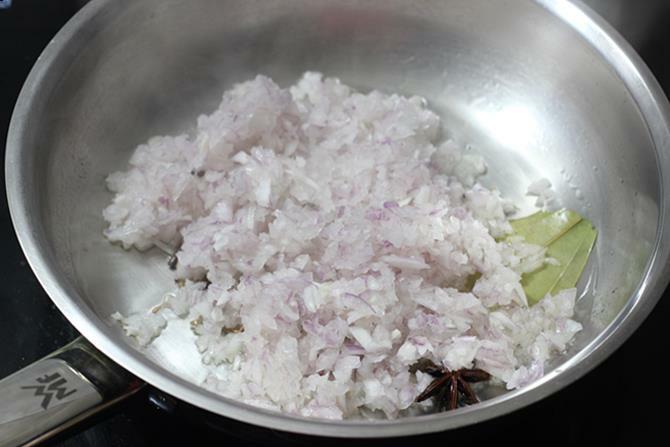 Add finely chopped onions, chilli and fry. Finely chopped yields a good gravy. 4. 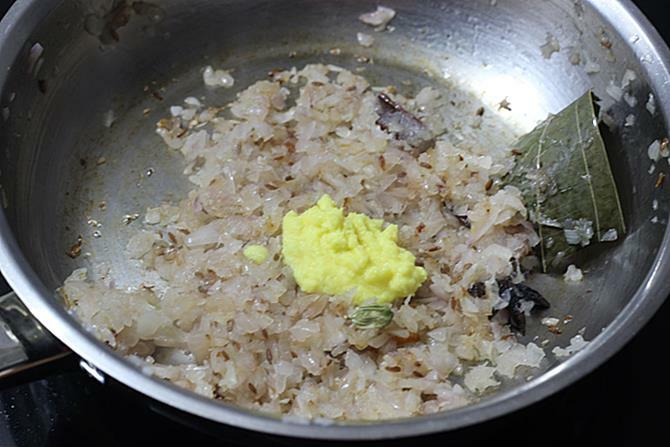 When the onions turn golden, fry ginger garlic paste till the raw smell goes off. 5. Add chopped onions, turmeric and salt. Fry until the tomatoes turn mushy. 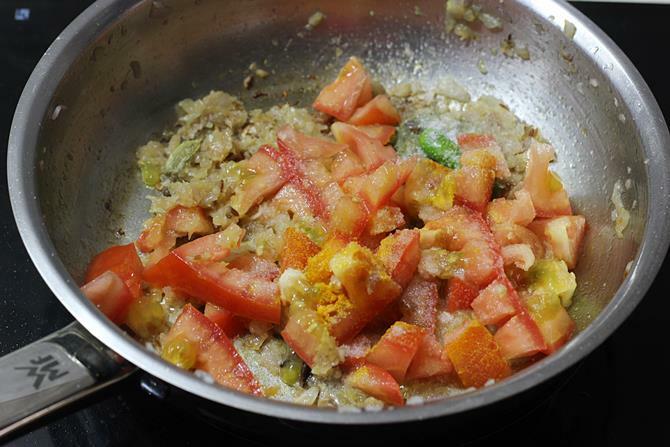 While the tomatoes cook, make a fine paste of coconut and poppy seeds or cashews. 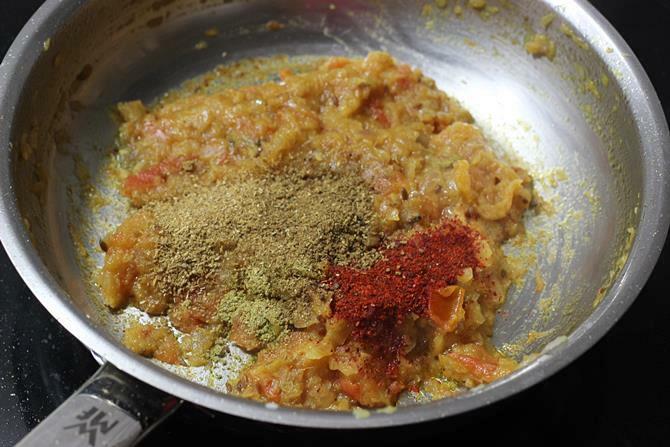 You can also add fennel seeds/saunf to the blender and make a fine paste together using little water. Set the paste aside till we need it. 6. Add garam masala, chili powder and saunf if you have not added at step 2 or 5. 7. Mix and fry until the raw smell of chili powder is gone. 8. Add the coconut paste. 9. Fry until it begins to smell good or it begins to leave the sides of the pan. This step takes about 3 to 5 minutes depending on how thin or thick your paste is. 10. Add coriander and pudina. I did not have pudina so did not use. But i suggest using for a good flavor. Fry for about 2 to 3 minutes. 11. Pour water just enough to make a gravy and cook covered on a low flame until slightly thick. Stir in between. Add the boiled eggs. You can also saute the eggs in oil at step 2 and add them to the pan now. 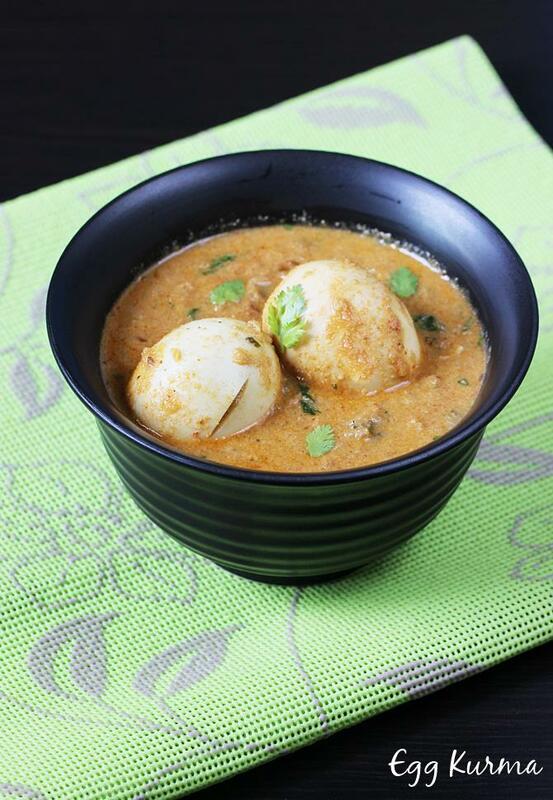 Fried eggs do lend a nice flavor to the korma. 12. 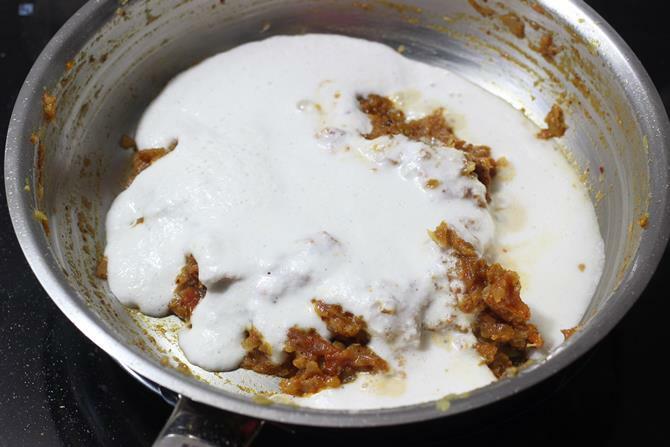 After a while the kurma thickens and oil begins to float lightly. Add coriander and switch off. 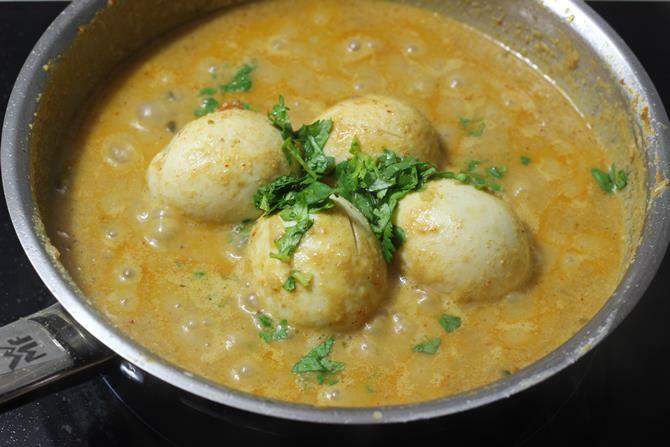 Egg kurma ready to serve with biryani, parotta and pulav. Thanks for trying. Can you tell me how it tasted? Excellent receipes taste good feel good. Hello, this recipe looks great, I just want to confirm that I grind coconut and cashew or coconut and poppy seeds correct? I have tried a couple other recipes of yours and they are fantastic (mushroom curry and gobi 65). Love your site!! Yes Priya, You are right. You can use coconut and poppy seeds or coconut and cashew. Thanks for trying the recipes. Glad to know they turned out good. Ike this very much thanks for swasthi yummy yummmmmy?